Any scanlation groups are free to use our English translation but since there are many groups that might want to re-translate a certain project, we will give permission to any group that contact us first. ✿ Always add our original credits page so people can find us. ✿ We do not provide already cleaned .psds because we do not usually save our copies of it even after releasing the project. We apologize for the inconvenience. ✿ Do not ask permission for projects we have not released yet in public. 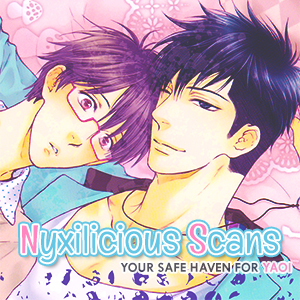 ✿ If you would like to use our own scans, send us an email about it. ✿ For the joint projects, you are allowed to retranslate as long as the other groups say their okay. ✿ One language per one project, eg. Spanish group retranslate Hello Again – you cannot ask permission for the same project unless the group is inactive. ✿ For the list of groups doing what title, please check them HERE. ✿ You are not allowed to edit nor alter our scanlations and make them as your own. ✿ Please use your own scans or if you see the scanner is “xryuchan27” then feel free to ask for it. ✿ Email this information to xryu.scans.143@gmail.com. ✿ You are free to work on any of our doujinshi scanlations without asking permission. ✿ You are not allowed to retranslate projects scanned by Sweet Fervor / metamorcy1 as per request by the scanner herself. ✿ Send the original scanners a message to ask permission in using their scans.